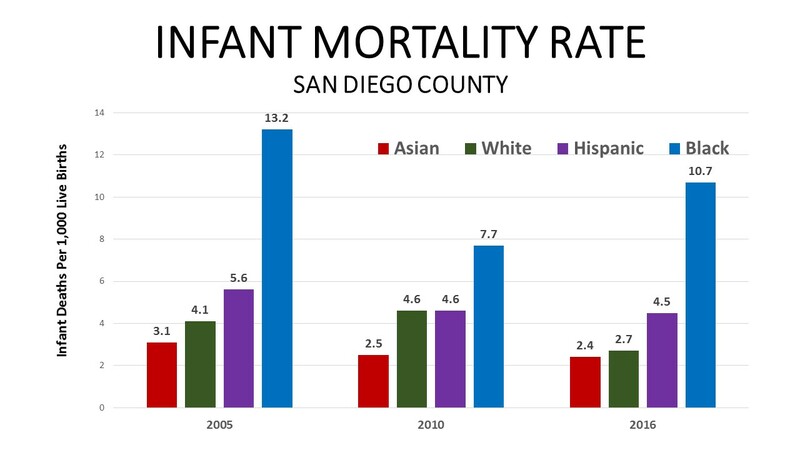 In 2016—the most recent year for which data is available in San Diego County—the rate of infant deaths in the region was 3.7 deaths for every 1,000 live births, well below the Healthy People 2010 national target of 6.0. In comparison, the infant mortality rate in California was 4.5 and 5.6 in the United States. The current San Diego rate is also much lower than the 5.9 deaths being reported in 2000. The same data show that the mortality rate for African-American infants went up to 10.7 in 2016, after reaching a low of 6.1 in 2011. Infant mortality refers to the number of babies who die before they reach their first year of age. While the number of infant deaths is small in San Diego County—about 44,000 babies are born every year—the rate is used as an indicator of the health status of a region and to compare health conditions of different ethnic groups. The County has been actively promoting healthy living as part of its Live Well San Diego vision, which aims to improve the health and quality of life of area residents. Progress has been made in preventing infant deaths over the past 20 years. The county rate began going down in 2000 and has consistently been lower than the state and the nation. Although the overall infant death rate and the rates for most of the different population groups in San Diego County have declined in the past 15 years, the infant death rate in African-American babies continues to be higher than that of other ethnic groups. This rate is more than triple that of other groups. In 2016, Asians had the lowest infant mortality rate of 2.4, followed by whites at 2.7, and Hispanics with a rate of 4.5. In recent years, there has been good news on this front. The infant mortality rate for African-Americans reached a single digit for the first time in the county in 2006 when 8.7 deaths were reported for every 1,000 live births. The reduction was due in part to the County’s Black Infant Health program, which offers services to pregnant African-American women and new moms with infants up to 3 months of age. Since 2000, the rate of infant mortality among African-American infants has varied between a high of 18.1 and 10.7 in 2016. “It’s great to see that infant death disparities are decreasing, but racial and ethnic gaps are still significant,” Wooten said. September is National Infant Mortality Awareness Month and Wooten is encouraging pregnant women to adopt a healthy lifestyle so that they can have a problem-free pregnancy and a healthy baby. Prenatal care, breastfeeding, immunizations and proper nutrition during the first years of life help improve healthy outcomes for babies. It is important for all women of reproductive age to adopt healthy behaviors, such as taking folic acid, maintaining a healthy diet and weight, being physically active, and quitting tobacco use and excessive drinking. For more information about the County Black Infant Health program or to enroll, call (619) 266-7466.